You are here: Home/ News/ Take the Scor Challenge! Activities on the pitch are fast winding down to conclusion, Winter has now arrived, Clocks are gone back, it’s November 2018 so it’s time for Clubs to switch their attention to indoor action! Yes, it is “Scór Time” once again, it’s the time of the year when club members take to the stage to display their cultural talents other than those football or hurling talents. 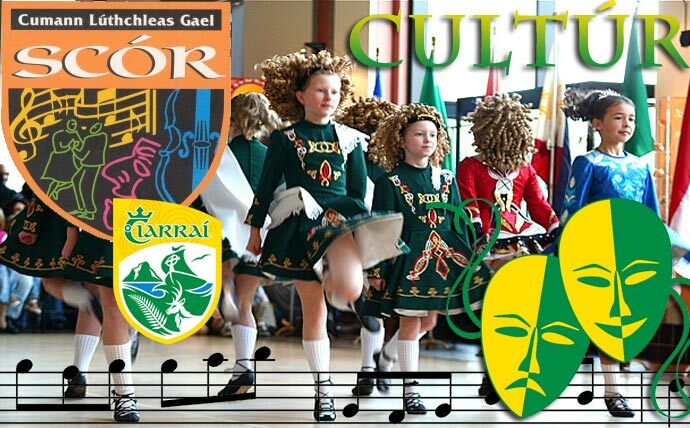 “SCÓR seeks to actively promote and support traditional Irish dance, music, song and other aspects of Irish culture through a range of competitions all designed to encourage participation, enjoyment, inclusion and excellence of our GAA club members”. Let’s all be part of it! Coiste Scór Chiarraí are urging your club Scór Officer (or other interested club Officer / member) to make a special effort this year 2018 -2019 to celebrate our cultural traditions and participate in Scór events – it being the 50th year of scór activity. * Make that extra special effort to show your club colours on the “Stage”, as the passion on the pitch, on the sideline, in the clubhouse can surely extend to the cultural aspect of GAA - that is Scór. To celebrate this special Golden Anniversary - every club in Kerry is invited, urged and challenged to make the effort “iarracht mór” to participate in at least one of the eight disciplines in (i) Scór Sinsear (Adults), (ii) Scór na nÓg (u-17 yrs. ), (iii) Scór na bPaistí (Primary Schools). We have a proud tradition here in Ciarraí of participation in the three Scór competitions. Every club have member(s) or Officer(s) who can assist your club with Scór this season by either participating, volunteering, organising, mentoring or encouraging other members to participate – adopt the challenge and the motto of “Yes I Can - Is Feidir Liom”. * Representing your club in Scór is Primary AIM – Participate -- “Winning” just a bonus! Scór Events / Disciplines (8); Participants 1. Solo Singing / Amhránaíocht Aonor, Individual 2. Recitation / Aitriseoireacht, Individual 3. Instrumental Music / Ceola Uirlise, 3 - 5 persons 4. Ballad Group / Balléad Grúpa, 3 - 5 persons 5. Stage Act / Léiriú Stáitse, 4 - 8 persons 6. Figure Dancing / Rince Foirne 4 - 8 persons 7. Set Dancing / Rince Seit, 4 - 8 persons 8. Table Quiz / Tráth na gCeist. Team of 4 persons * All participants to be registered members of the club. (iv) All Ireland Finals on Saturday 23rd February 2019 at RDS Dublin. (iv) All Ireland Finals on Saturday 13th April 2019 in RDS Dublin. Scór na bPaistí; (Primary School children) organised at County level only during March and April usually – details to be confirmed later. Check with your District Board for details of date / venue / time of Scór local competitions. Participation and representing your club are the Primary AIM - winning is only a bonus! Calling on GAA members to show off your undoubted cultural talents and proudly represent your club and show your colours on the stage instead of the pitch! Cathaoirleach; Christy Killeen, Leas Cathaoirleach; Jackie Walsh, Runaí; Suzanne Ní Laoighre Leas Runaí Mary Philpott, Siobhain Casey Cisteóirí; Anita English, Theresa Keating, P.R.O. ; Jack Hennessy, Chief Steward; P.J. Mulvihill, Munster Delegates; Tom Herlihy, Jackie Walsh. All officers are available to offer Eolais, guidance and assistance to clubs on Scór. Kerry clubs have had great success at both Munster and All Ireland levels down through the years. Involve and discuss with Coiste na nÓg section of your club – all waiting to be asked!!! Míle Buiochas to you for taking on the above challenge – all efforts much appreciated. Coiste Chiarraí extends best wishes to all clubs, teams and individuals participating in Scór, enjoy the experience of representing your club on the stage. Ciarraí Abú.